The Commonwealth of Puerto Rico is an unincorporated territory of the United States, located in the northeastern Caribbean Sea, east of the Dominican Republic and west of the Virgin Islands. The total area of Puerto Rico is 9,104 km2 (3,515 square miles). The 2009 estimated population was 3,967,179. Demographically, the people of Puerto Rico can be categorized as follows: White (mostly Spanish origin), 76.2%, Black, 6.9%, Asian, 0.3%, Amerindian, 0.2%, Mixed, 4.4%, and other, 12%. The majority of the people in Puerto Rico are Roman Catholic. Puerto Rico, an island about 100 miles (165 km) long and 35 miles (55 km) wide, is the smallest of the four Greater Antilles (Cuba, Jamaica, and Hispaniola). San Juan, the capital of Puerto Rico, is 1,600 miles southeast of New York City, and 1,000 miles southeast of Miami. The island's 3,435 square miles of land surface supported a population of 2,276,000 in 1957 or a density of 663 persons per square mile, with a 10 person per square mile increase each year in 1957. The island was discovered by Columbus in 1493, and remained a Spanish colony for 400 years. It was ceded to the United States in 1898 following the Spanish American War, and in 1952 became an American commonwealth with almost complete self-government. Puerto Rico has a subtropical climate; its chief agricultural products in the 1950s were sugar cane, tobacco, and coffee. Puerto Rican culture was more Spanish than American, though Spanish customs have been modified considerably by American influence. During a ten-year period after World War II Puerto Rico intensified its industrial economy. More than 400 American industries entered Puerto Rico, changing the economy from an agricultural to an industrial one. The average family income increased from $660 in 1940 to $2,400 in 1956. Mennonite interest began in 1943, when the Mennonite Central Committee responded to an invitation of the Brethren Service Committee to establish a Civilian Public Service medical and social service program in the La Plata Valley. The Brethren CPS unit was begun at Castaner in August 1942, after the door was closed to CPS men in foreign countries. The MCC service program included medical, recreational and educational, and agricultural service. In January 1950 the MCC service program was transferred to the Mennonite Relief Committee, an agency of the Mennonite Board of Missions and Charities (Mennonite Church), which had begun evangelistic work at Pulguillas in December 1945. In 1947 a Mennonite (MC) church was also organized at La Plata. The Convención Iglesias Evangélicas Menonitas de Puerto Rico (Puerto Rican Mennonite Conference) was organized in 1955 for fellowship, unity, evangelization, and service. It originated in the work of Civilian Public Service (1943) and of the Mennonite Board of Missions (Mennonite Church) starting in 1945. Most churches were located between San Juan in the north and Ponce in the south. An executive committee, served by the executive secretary, carried out the decisions of conference delegates to an annual assembly. During the 1950s Mennonite Board of Missions (MBM) sponsored 55 persons in Puerto Rico to support and plant churches and institutions. Most were from rural backgrounds, but in the 1950s workers planted most churches in towns. The Mennonite Bible Institute trained young Christians who later became leaders. Institutions established in the 1940s—the Mennonite Hospital at Aibonito, the Betania Mennonite Academy, and Luz y Verdad (Light and Truth) radio program—were rooted more firmly in the church, and Mennonite Voluntary Service provided personnel, 1950-1984. The conference grew to 425 members by 1960. In the 1960s the church planted its first urban churches (San Juan and Bayamon). The Bible Institute, now an extension program (theological education by extension), provided training of pastors and other members. Puerto Rican leaders tentatively began to shape the life of the church, although missionary models still dominated. By 1970 the conference had 660 members and 13 congregations. In the 1970s the church continued to move toward coastal cities while experiencing disconcerting situations: social-political changes and an economic depression; the emigration of some church leaders; increasing varieties of church piety and practice; the exit of most missionaries and voluntary service personnel; and adjustment to new leadership styles. By 1980 the conference had about 950 members in 17 congregations. Since then the church has worked to forge a common identity; evaluate its relation with MBM and the Mennonite Church (MC); train current and potential leaders effectively; relate wisely with Mennonites in the Caribbean and Central America, and with other denominations; reshape its peace witness; affirm national leadership and assimilate leaders trained in other Christian traditions; and disciple new members and retain current members. In 1986 the conference had 893 members in 16 congregations, ranging from 9 to 137 members. The average age of the congregations was 23 years. Half of the members were in rural churches, the rest in towns and cities. See also Broadcasting, Radio and Television. Hege, Christian and Christian Neff. Mennonitisches Lexikon, 4 vols. Frankfurt & Weierhof: Hege; Karlsruhe: Schneider, 1913-1967: v. III, 408-410. Holsinger, Justus G. The Mennonite Work in Puerto Rico, 1941-1981. Elkhart: Mennonite Board of Missions, 1981. Holsinger, Justus G. Serving Rural Puerto Rico: A History of Eight Years of Service by the Mennonite Church. Scottdale, 1952. Kraybill, Paul N., ed. Mennonite World Handbook. Lombard, IL: Mennonite World Conference, 1978: 261-263. Manual Ministerial Una Guía de Doctrinas, Prácticas y Recursos. Concilio de la Conveneón de las Iglesias Evangélicas Menonitas de Puerto Rica 1986. Mennonite World Conference. World Directory = Directorio mundial = Répertoire mondial 2012: Mennonite, Brethren in Christ and Related Churches = Iglesias Menonitas, de los Hermanos en Cristo y afines = Églises Mennonites, Frères en Christ et Apparentées. Kitchener, ON: Mennonite World Conference, 2012: 26-27. The Power of the Gospel in a Changing World, Mission Board Report, 1954. Rosado, Raul. "Las congregaciónes evangélicas Menonitas," and Rodrigues, Luis Elier. "Las Iglesias Menonitas Unidas para server." Unidos para que el mundo crea, ed. David W. Powell. Aibonito, Puerto Rico: Iglesias Evangélicas Menonitas de Puerto Rico, 1982: 37- 44, 45-48. Wikipedia. "Puerto Rico." Web. 10 November 2010. http://en.wikipedia.org/wiki/Puerto_Rico. Holsinger, Justus G. and David W. Powell. "Puerto Rico." Global Anabaptist Mennonite Encyclopedia Online. May 2013. Web. 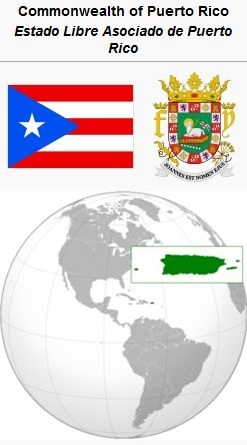 20 Apr 2019. http://gameo.org/index.php?title=Puerto_Rico&oldid=146071. Holsinger, Justus G. and David W. Powell. (May 2013). Puerto Rico. Global Anabaptist Mennonite Encyclopedia Online. Retrieved 20 April 2019, from http://gameo.org/index.php?title=Puerto_Rico&oldid=146071. Adapted by permission of Herald Press, Harrisonburg, Virginia, from Mennonite Encyclopedia, Vol. 4, pp. 230-231; vol. 5, pp. 737-738. All rights reserved.